* This is the final article in the series on Jesus in the book of Mark. Here in comfortable modern-day America, many of us are content to attend a worship service, sing the words to a few hymns or songs, and spend the rest of our week mostly unchanged by what we have done. At best, we pray and read our Bibles routinely. What a stark contrast to the suffering of our brothers and sisters around the world! In Vietnam, tribal Christians are hunted like wild animals. In one village, a pastor’s arms were tied with ropes and stretched until nearly torn out of his shoulder sockets. In a militant attack on a church in the Philippines, a baby was impaled with a bayonet. In the Nineveh Plains of Iraq, terrorists burned ancient Christian manuscripts. Elsewhere in the Middle East, churches are decimated while Christians are mass-executed by beheading or crucifixion. The torture is brutal: stories run rampant in which fingernails are torn off, humans are caged for sport, eyes are gouged out, and body parts are mutilated beyond recognition. And still, in our research, we have read of tortures so graphic that we cannot print them on this blog. This is our final article in the Mark series, and we have been blessed to study the person and nature of Jesus Christ. But we have saved the hardest part for last, for there is more to the imitation of Christ than abandoning hypocrisy, seeking God’s kingdom, serving others, and living authoritatively. Indeed, to be a Christian, one must be fully committed to the cause, ready at a moment’s notice to suffer and die for the faith. We know this, but do we live it? How often do we compromise on our values, remain silent about our faith, or relegate evangelism to others simply because we’re afraid of getting insulted or looked down upon? How often are we ashamed of the name of Christ? Brothers and sisters, I would argue that we have no less of a responsibility to be bold about our faith than those who face much worse. In the free world, we may not have to face the grisly knife of the executioner or the sting of the whip, but we can take a stance on truth even if it makes us unpopular. We can at the very least identify as Christians in the workplace, even if we’re prohibited from sharing the tenets of our faith. Jesus demanded radical discipleship – a discipleship through which a person is utterly transformed and ready to live for the faith no matter what. And Jesus himself ought to be our inspiration, for his willingness to die was the greatest example of sacrifice. How often we forget that he sweated great drops of blood in Gethsemane and yet prayed, “Father, all things are possible for you. Remove this cup from me. Yet not what I will, but what you will” (Mark 14:36). He, too, experienced fear and anguish, and yet he overcame with great courage. “For whoever would save his life will lose it, but whoever loses his life for my sake and the gospel’s will save it” (Mark 8:35). “And when they bring you to trial and deliver you over, do not be anxious beforehand what you are to say, but say whatever is given you in that hour, for it is not you who speak, but the Holy Spirit” (Mark 13:11). “Truly, I say to you, there is no one who has left house or brothers or sisters or mother or father or children or lands, for my sake and for the gospel, who will not receive a hundredfold now in this time, houses and brothers and sisters and mothers and children and lands, with persecutions, and in the age to come eternal life” (Mark 10:29-30). Is it not comforting to know that the Spirit can equip us with courage if we only ask? Is it not the greatest hope that our willingness to suffer will never be in vain, but will be rewarded in the life to come? This is why Jesus calls us to a discipleship far greater than nominal commitment. If we are willing to be insulted, mocked, or even killed for the gospel message, we will not only attain eternal life, but also gain the honor of suffering for our Savior and the rewards that come with it. Beloved, we may someday face more than just ridicule for our faith, but until that day comes, let us be bold and steadfast, striving to win the crown of life and cast it at the feet of Jesus. Another great verse is in John 15: “A servant is not greater than his master. If they persecuted me, they will also persecute you.” Profound words of Jesus. This is another incredible verse about discipleship. Thanks for sharing! Wow. This is powerful. It’s tragic to think about how we live so apathetically when Christians abroad face horrendous persecution. Thanks for drawing our attention to this. Thanks, Sarah! 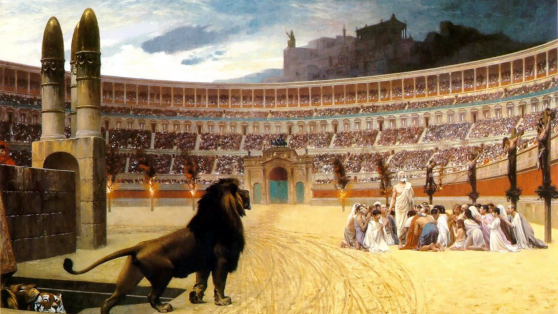 And amen – we need to be aware of the persecution going on!